What immediate actions need to be taken in case of a cat bite? Even if the injury caused by a scratch or bite looks really harmless on the outside? Is it required to administer antibiotic immediately after a cat bite occurred? Is it necessary to run a blood test in order to confirm an infection? Does it make sense to use x-ray images to confirm an infection? Regardless of whether an injury involving a cat was caused by a bite or a scratch: it is advisable to go see a doctor! Yes, many cat bite injuries or deep scratches caused by a cat´s claw typically appear very harmless on the outside. On the surface the wound often does not exceed a few millimeters and if left untreated usually scabs over quickly. 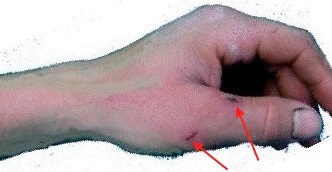 The image shows a quickly spreading inflammation due to a cat bite to the metacarpophalangeal joint of the index finger. Please note the reddening on the injured finger as well as the massive swelling to the back of the hand. 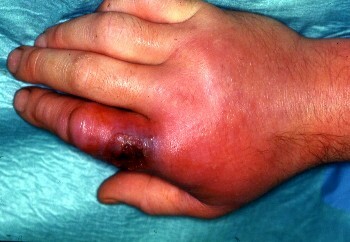 The caption shows the typical image of a severe phlegmon to the back of the hand following a cat bite. The problem with cat bites is the fairly high risk of infection (around fifty percent). An injury caused by a claw or a tooth of a cat frequently reaches deep down underneath the skin of the injured hand. There, the penetrated bacteria proliferates at a fast pace. The bacteria will find excellent breeding grounds, especially if a tendon sheath or joint of the hand was injured as well. From there it will spread out very quickly. The forming suppuration many times cannot properly drain off through the tiny external wound. The proliferation of the pus often occurs within the injured joint, tendon or fatty tissue. Inflammation of the lymphatic vessels caused by a cat claw. These two small injuries inflicted by the claw of a cat look very harmless on the outside. Reddening and swelling of the infected lymphatic vessels. The illustration evidences the potential risk of what may appear to be a harmless injury: The lymphatic vessels show reddening all the way up to the armpit. The lymph nodes in the armpit are already swollen. This is a controversial question. A great number of doctors prescribe antibiotics containing penicillin, since these drugs tackle a number of germs and – best case scenario – may even prevent an infection from breaking out. However, the administration of antibiotics may impact the course of the infection leading to unspecific symptoms which in turn could masquerade the extent of the infection and in the worst case unfavorably delay the required surgical procedure. Therefore antibiotics should never be used in lieu of a surgical measure in connection with animal bite injures. They may however, support the surgical procedure and associated convalescence. A lab test is definitely a very helpful tool when assessing a cat bite injury, however, it is not recommendable to wait until the blood test results (in this case: white blood cells / sedimentation rate, CRP =C – reactive protein) return to confirm an infection. The judgment on the necessity of a surgical intervention should be based upon the clinical manifestation of the injured hand. Nevertheless: the lab test – even in the early stage of the infection – is a very valuable tool as it efficiently allows to monitor the course of the infection. No. An x-ray – particularly during the early stage of an infection – does not provide conclusive certainty. In many cases it may, however, be useful to obtain an x-ray image to identify associated problems such as bone fractures.